future Internet of Things (IoT) imperative for the following discrete manufacturing industries: automotive, aerospace and defense, high tech, and industrial machinery. We highlight IoT-enabled scenarios — those possible both now and in an Industry 4.0 future with smart manufacturing. 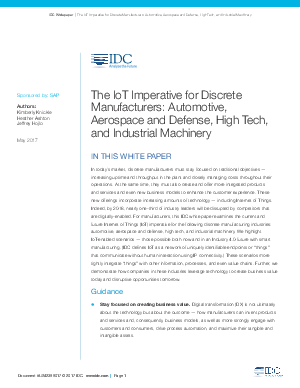 (IDC defines IoT as a network of uniquely identifiable endpoints or “things” that communicate without human interaction using IP connectivity.) These scenarios more tightly integrate “things” with other information, processes, and even value chains. Further, we demonstrate how companies in these industries leverage technology to create business value today and disruptive opportunities tomorrow.